Walnut oil is a good source of omega-3 fatty acids. Omega-3s are essential polyunsaturated fats that your body cannot produce; you must obtain them from food. Dr. Frank Sacks, of the Harvard School of Public Health, reports that important functions of omega-3 fatty acids include controlling blood clotting and building cell membranes in the brain. There are three omega-3 fatty acids—alpha-linolenic acid (ALA), docosahexaenoic acid (DHA) and eicosapentaenoic acid (EPA). Walnut oil contains ALA.
ALA protects your heart in several ways. According to the Natural Medicines Comprehensive Database, it reduces atherosclerotic plaque in coronary arteries, decreasing risk by 62 percent for every gram of ALA consumed. High dietary intake also decreased risk of a first heart attack by 59 percent in men and women and, in women, reduced risk of heart disease death by 65 percent over 10 years. After a heart attack, ALA decreased risk of a second heart attack and death when eaten as part of a Mediterranean diet low in saturated fat and cholesterol. Dr. Sacks reports ALA also reduces inflammation and protects the heart against rhythm problems that can cause sudden death. According to the American Journal of Clinical Nutrition, Dietary Reference Intake levels for ALA have been set at 1.6 g daily for men and 1.1 g for women aged 19 to 50. This is the level at which no deficiency is present. To protect your heart, aim for a higher intake. In studies, ALA intake has ranged from 0.58 g to 2.81 g daily. Walnut oil contains 1.414 g ALA per tablespoon. Other good sources include flaxseed, canola, soybean and olive oils, English or black walnuts, ground flaxseeds and pumpkin seeds. Brussels sprouts, kale, spinach and salad greens contain lesser amounts. While ALA is found in plant foods, DHA and EPA are present in fatty, cold water fish. They help to prevent and manage heart disease and can lower triglyceride levels while improving the “good” HDL cholesterol. The American Heart Association recommends that you eat two 3.5-oz. servings weekly of fatty fish. Good sources include salmon, herring, mackerel, trout, sardines, anchovies and canned light tuna. 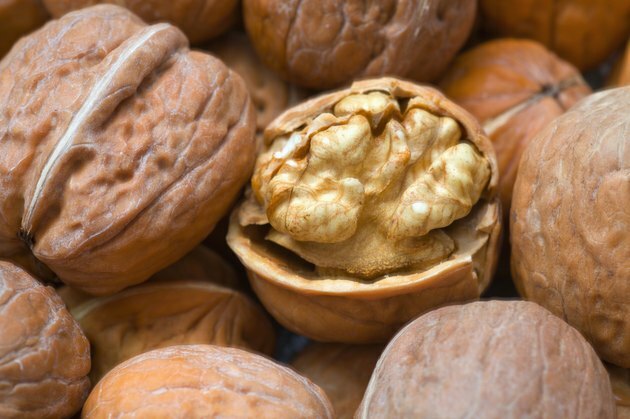 Walnut oil, made from English walnuts, has a delicate, nutty flavor. It has a shelf life of 6 to 12 months. Refrigerate it or keep it in a cool, dark place to keep it from turning rancid. Use walnut oil as a salad dressing, either alone or paired with sherry vinegar, mustard and garlic. Cuisine.co suggests tossing it with pasta or with parsnips or Brussels sprouts. It goes well with bitter vegetables, such as endive, radicchio and spinach. Walnut oil is not recommended for cooking at high temperatures, as this destroys its delicate flavor.